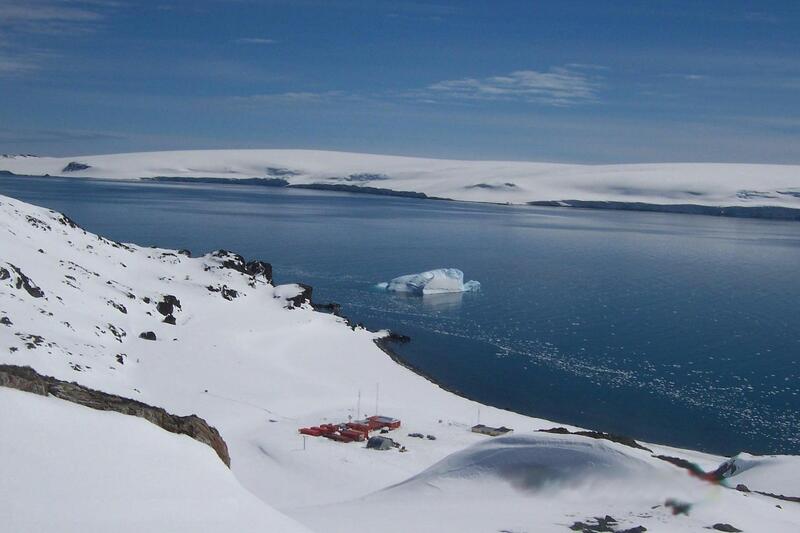 Juan Carlos I Antarctic Station, a seasonal scientific station operated by Spain on the Hurd Peninsula, on Livingston Island in the South Shetland Islands, Antarctica. Our last day was also a first: no other expedition ship has landed passengers at our morning site, Binn’s Bluff on the Hurd Peninsula of Livingston Island in the South Shetlands. Ian Dalziel has done field work here and recommended the spot, which provided nice outcrops, great snowfield and ridge climbing (and sliding! ), and exquisite lichen beds. Getting onto the beach was challenging, though, with a swell on a steep beach of cobbles. “It’s not the place to practice your ballet moves,” someone said. It took several staff to hold a boat steady for unloading and help landers up the beach. At least one passenger cheerfully declined to go ashore and opted for a private Zodiac viewing of the outcrops from the sea. This kind of landing is where Cheesemans’ excels among Antarctic tour companies: with a much higher number of staff than most voyages, going ashore in exceptional places in less than ideal conditions becomes not only possible but the hallmark of a great tour. There is no colony here but small numbers of Chinstrap Penguins sunned themselves on the beach rocks and a lazy posse of elephant seals occupied the far end of the beach. Seal bones on the beach included occasional mummified flipper remains from the days of sealing a hundred years ago. A wave-cut platform perhaps 20 meters high directly behind the beach provided nice vistas of the peaks and glaciers across the bay, or close-up looks at the intricate tufts of filamentous lichens, like miniature forests blanketing any exposed rocks. From the bench there was a sweet snow slide back down, or access to higher outlooks. An intrepid group ranging in age from teens to 60s climbed nearly to the sky on a steep scree slope covered in snow. Those of us below watched with envy as they bounded back down, and a few scored the longest sliding run of the whole trip. After lunch we made our very last landing at a traditional farewell spot, Hannah Point, also on Livingston Island. 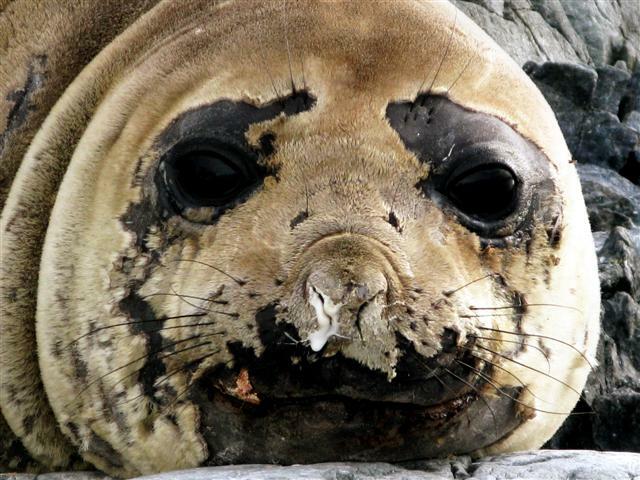 As Ted Cheeseman told us, there’s a little bit of everything here: three species of nesting penguins, a Giant Petrel colony, “the smelliest elephant seal wallow in Antarctica,” a red jasper vein, and plant fossils a mile down the beach for the geologists. The beach landing was easy and protected, though the breeze was stiff and a raft of anchored Zodiacs attempted their own visit of the fossil beach before alert staffers repositioned them. All the drama of life, reproduction, and death were on display this afternoon. First of all, the classic Gentoo Penguin “chick chase” was in full swing, where nearly-grown fluffy chicks are athletically tested by their parents. To go anywhere on this jagged point one must pick a way carefully among clusters of penguin nests, and try not to get run over by topsy-turvy tubby Gentoo chicks trotting full-tilt after their parents begging for food. The adults run away closely pursued by their one or two chicks who sometimes tumble over each other. It’s quite comical but also serious, since the fittest get fed. 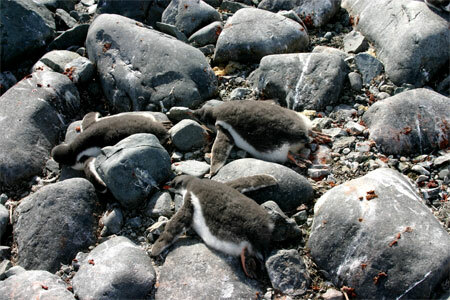 Exhausted penguin chicks then plop down haphazardly to rest, sometimes looking dead as they snooze with legs and flippers splayed where they fell. These gentoo penguin chicks are taking a nap after eating a big meal. 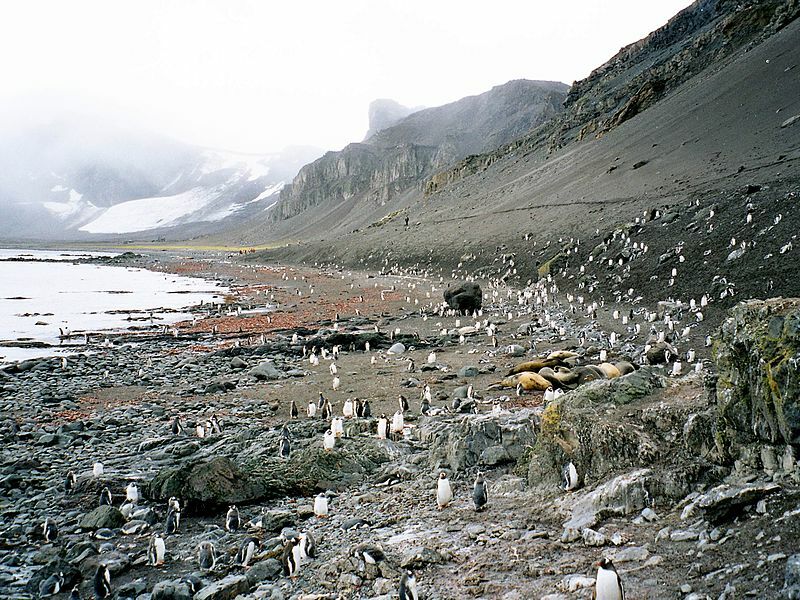 Amazingly, there were also some Gentoo nests where chicks were only a week or two old. These were the ones the opportunistic skuas kept an eye on. As with every colony we visited there were picked-over chick carcasses littered about, but this time some of us witnessed an attack. An alert skua nabbed a tiny chick in its bill when its parents stepped away and in seconds carried it out of the colony to some open ground – right in front of the boots and cameras of several expeditioners. This chick mercifully had a quick death, just a couple minutes; despite their hooked bills, skuas do not have the recurved talons that raptors like owls and hawks use to impale their prey. Death by skua takes longer the bigger the victim. The whole event made for some exciting photography and a visceral apprehension of the vibrant, but short, food chain in the Antarctic. 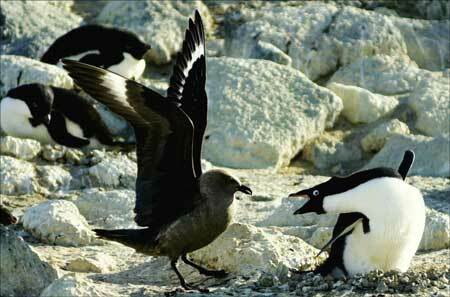 A skua tries to chase a penguin away from its nest. Chinstrap Penguins have some dense nesting clusters here too and their solid gray chicks were as big and fluffy as the Gentoos, but content to stay on their nest to beg. 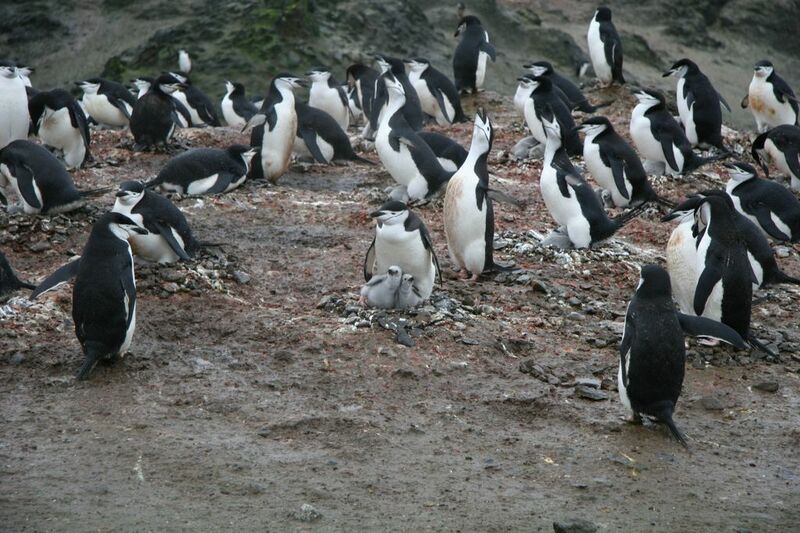 One lone Macaroni Penguin sat with its chick right in the middle of the Chinstrap colony. The local skua pair loosely guarded their own fuzzy brown chick nearby, where it was free to amble about. Two spotted Kelp Gull chicks also nearby kept each other company and investigated their surroundings in between visits by their scavenging parents. 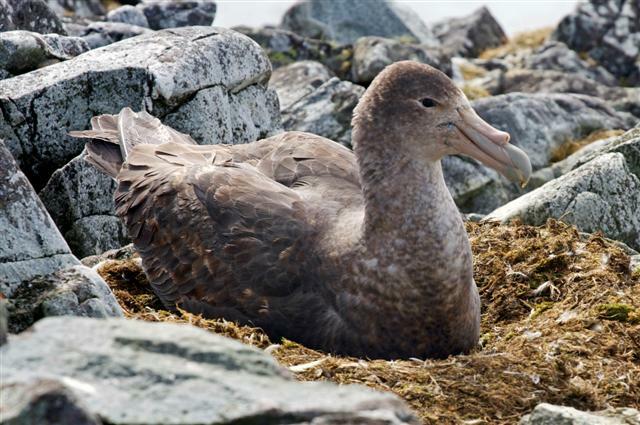 On the higher rock outcrops above all the penguins were a couple dozen nests of the huge Giant Petrels. Even with a spotting scope and binoculars trained on the brooding parents, staff naturalist Jim Danzenbaker never saw one stand up to reveal whether it had egg or chick on the nest. The geological highlights were the beautiful vein of hard, red jasper that juts out of an eroding outcrop above the beach, and the plant fossils farther along the bay. The fossils were formed during periods of sedimentation and warm-climate vegetation in between bouts of volcanic activity. As a result the fossil-bearing outcrops are over- and under-lain by volcanic strata. The actual fossil layers are above scree slopes but previous visitors have gathered a representative sample near a house-sized boulder at sea level. Collecting fossils from this heavily-visited site is strictly forbidden, a directive that was clearly conveyed to all before we set foot on land. We were glad this terrific spot is still open to tourists, thanks to continued compliance by expeditioners. To reach either the jasper or the fossils one must pass by one or more remarkably odiferous elephant seal wallows. Somehow, unlike on most other beaches we’ve visited, these animals manage to get completely soiled while they lie together for their three-week molt. Perhaps it’s because they are up above any potentially cleansing ocean spray, or because they lie on an impermeable dirt substrate that resists their collective effluent, or both. Despite their caramel-brown coating, their beasts’ big eyes and sleepy smiles are as enjoyable here as they are anywhere, as long as one stays upwind of them. It was a fitting wrap-up to this remarkable geology-focused cruise, and we still had two more sea days of enriching lectures and fun activities ahead (slide show! auction! packing!). Thanks for some other wonderful article. Where else may just anybody get that kind of info in such a perfect approach of writing?